we are also supplier of chalk lumps across india to various distributors. 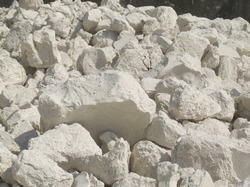 Chalk lumps used in different process in manufacturing industrial units. Chalk lumps has been widely using in industries. We are supplier of welknown industries through india. With immense market experience we have been able to provide optimum quality Porbandar Chalk Lumps. Patel J.K. and T.K. & Co.